Since this movie was released a couple of weeks ago, I have heard nothing but bad reviews about it. 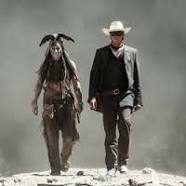 I couldn’t understand how a movie full of cowboys and indians, horses and trains, guns and explosions, and saloon dance hall girls could possibly get a bad review. But there they were (the reviews), so much so I considered not going to see the movie at all. In spite of the bad reviews and my own reluctance to spend my time and money watching it, last night I went to see the movie anyway. After seeing the movie I now understand something about the reviewers, they are idiots. It was a good movie. It was full of cowboys and indians, horses and trains, guns and explosions, saloon dance hall girls and the pining widow of the Rangers murdered brother. How can it get any better than that?! Many of the reviewers complained about the flash backs, flash forwards, flash sideways, etc. but I thought they greatly enhanced the story. The best ongoing flash forwards were to “Tonto” as an old man in a carnival side show telling a story to a child. My only criticism would be that Armie Hammer’s character of “The Lone Ranger” was a little too flawed. His character was more of a “Mr Magoo” than “The Lone Ranger". The same story line could have been maintained if this character had been more of a “Ferris Bueller", and it would have fit better with the image of “The Lone Ranger". The one thing to learn about the reviews of “The Lone Ranger” is the movie reviewers are idiots. These are probably the same people who think “Citizen Kane” is the greatest movie of all time. They probably sit around their DVD’s playing the end of “Citizen Kane” over and over again so they can hear Kane’s dying breath uttering “Rosebud", then they giggle and whisper to each other about how “Rosebud” is really a reference to the nether regions of the mistress of William Randolph Hearst. Somehow these reviewers think that makes “Citizen Kane” the greatest movie of all time.